Installation view, Lionel Maunz: Discovery of Honey / Work of the Family, The Contemporary Austin – Gatehouse Gallery at the Betty and Edward Marcus Sculpture Park at Laguna Gloria, 2017. Artwork © Lionel Maunz. Courtesy the artist and Bureau, New York. Image courtesy The Contemporary Austin. Photograph by Colin Doyle. Lionel Maunz, New Mother / You Must Increase As I Must Decrease, 2017. Concrete, steel, and iron. 62 x 36 1/4 x 18 inches. Artwork © Lionel Maunz. Courtesy the artist and Bureau, New York. 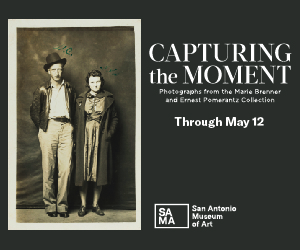 Image courtesy The Contemporary Austin. Photograph by Colin Doyle. 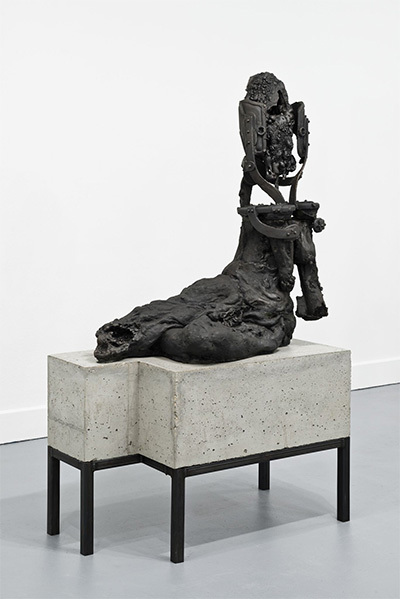 Exploring the aesthetics of self-destruction, Lionel Maunz uses cast iron, concrete, and steel to create dystopian figurative sculptures—surprisingly organic forms that appear distorted by dismemberment and decay. 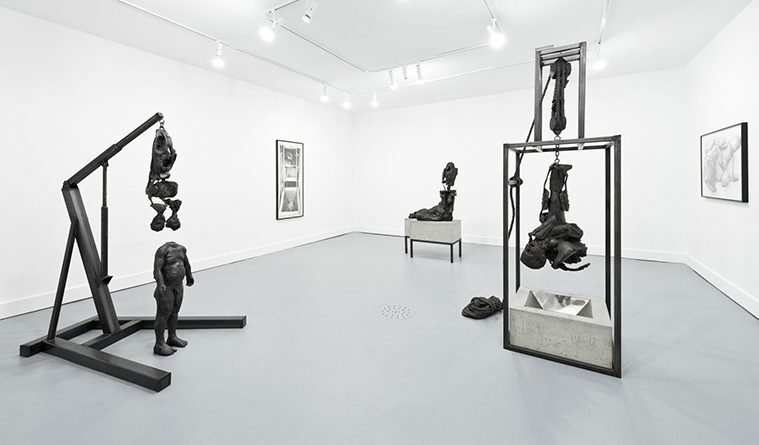 His current exhibition, Discovery of Honey / Work of the Family, which he describes as a “personal interrogation of childhood and parenthood,” is on view through May 14 at The Contemporary Austin. Maunz is inspired by classical art, exploring gothic themes of fear, violence and religion. 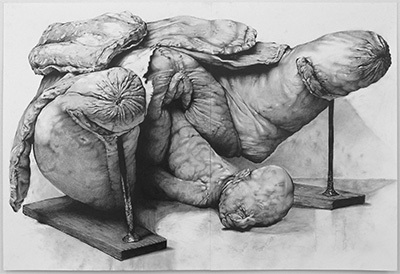 Ineffably troubling and provocative, his work is decidedly more intuitive than rational, and his grotesque figures are somewhat comparable to the most unsettling imagery of Hieronymus Bosch. With these references to honey in mind, he decided to create a unified theme for the show. Originally planned as a family group with two parents and three children, he split up them up, removing a couple figures entirely and slicing some of others apart. Lionel Maunz, Black River, 2017. Graphite on paper. 27 x 39 1/4 inches Artwork © Lionel Maunz. Courtesy the artist and Bureau, New York. Image courtesy Bureau, New York. Maunz was initially trained as a painter at Southern Methodist University in Dallas and now lives in New York. He grew up drawing “cars and dead bodies,” but didn’t take a career as an artist seriously until his professors encouraged him to pursue the violent imagery that interested him. “If something excites me, it stays with me,” he says. And excitement does not seem to come easily for him. He credits a “burn reconstruction medical textbook” as a source of inspiration. He also acknowledges R.D. Laing’s writings on psychosis, Harry Harlow’s social isolation experiments on primates, and Peter Sotos’s examinations of sadistic sexual criminals. 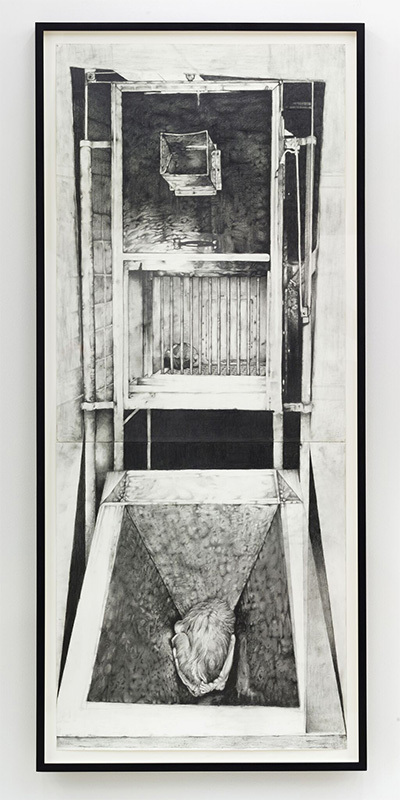 Lionel Maunz, Vertical Chamber, 2016. Graphite on paper. 53 x 21 3/4 inches. Artwork © Lionel Maunz. Courtesy the artist and Bureau, New York. Image courtesy Bureau, New York. 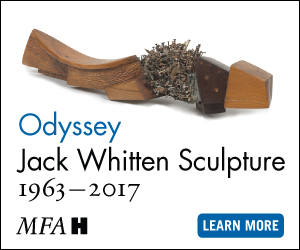 The sculptures in Discovery of Honey / Work of the Family are accompanied by Maunz’s drawings, which are even more direct and representational. Black River is a festering image of a rotting baby protruding from a womb sitting on a primitive delivery platform. The mother’s legs are amputated at the knees and nothing else remains of her body. Discovery of Honey is a sculpture of a child strung up by his feet. Annunciation is a sculpture of a beheaded boy. The Contemporary Austin commissioned Lick Your Throat and Cut Your Feet for the Betty and Edward Marcus Sculpture Park. It looks like a monument made out of random body parts. He seems to find a physical body with a consciousness irreconcilable.